Is that great, or what!?! She was even kind enough to send me a couple and I won't lie... I was as excited as a kid on Christmas morning when they arrived. I took my color cues from the green foliage pattern in the leather and paired that with the spring vibes I've been feeling and came up with a lilac color scheme. This pattern takes a long time to knot and adding a bead in the center of each of the shapes drug that out into eternity. I do think it was worth it, though. 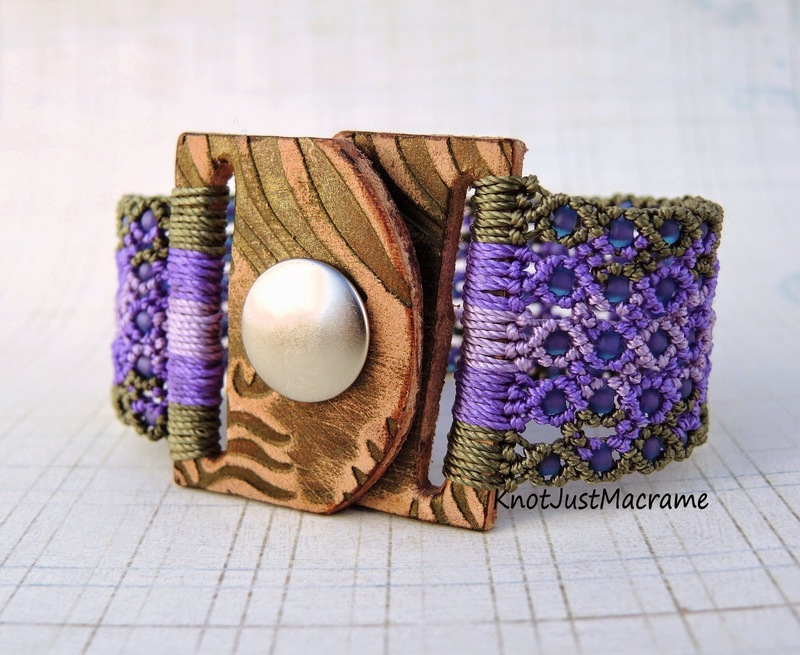 If you would like to try your hand at this pattern, you can find a version of it in my Marquise Micro Macrame Cuff class on CraftArtEdu.com. If you are interested in some of Melinda's components, you will want to check out her shop. I'll show you the other things she sent to me, but you have to promise not to be jealous. Promise? Those little circles? Those are OWL EYES!!! How cool is that! I can't wait to try them out in an owl design. And I definitely will be ordering more clasps! This bracelet is gorgeous, I love it and lots of beads. Beautiful. Love your designs. I'm also lusting after some of Melinda Orr's components - both metal and leather. I am, too, Ann!! I want them all!! Love that pattern! Gorgeous clasp. Everything came together beautifully!! Beautiful bracelet! The clasp is fantastic! Thanks for sharing!